This great introduction to Archery is ideal for developing hand eye co-ordination and aiming skills from a young age. This session is 1.5 hours of supervised target practice, including all equipment. This experience is a perfect introduction to the sport of Archery. This session will teach your child the basic skills and techniques required to progress over a time span of 1.5 hours. There will be instructors helping the children and providing supervision at all times. Let them feel the strength of the bow and the speed of the arrow as they fire at a variety of targets developing accuracy each time! Once you have arrived and been welcomed to the centre the day will begin with a safety brief and introduction to the equipment. Then, once ready you'll be straight on to the firing range where you can take aim, fire and improve your archery skills for one and a half hours! A great experience for familes and those with a fancy for the weapons of old! Children must be accompanied by a participating adult, which can be purchased here. Archery is available between March to October. There are also sometimes dates within the school half-term holidays in February. This archery experience is suitable for children aged 6 and over. The archery experience will last for around ninety minutes, but please allow up to two hours at the centre. Participants: The Archery Experience - Child is for 1 participant. The group size is approximately six. Spectators are welcome to watch from a safe distance. All archery equipment will be provided on site. Please wear sensible shoes, comfortable clothes and long sleeves. This experience takes place outdoors, and is therefore weather dependant. If you have cause for concern, please phone beforehand to ensure the activity is going ahead. If the experience is cancelled due to weather constraints, it will be rescheduled for another day. My son is 6 and had an amazing time learning archery from a really encouraging and fun instructor. He was really engaged and loved taking part, from choosing equipment to taking aim and shooting both professional targets and secured balloons at the end during the games. He has asked to go again which is a fabulous endorsement of our afternoon. Even the rain didn't spoil our enjoyment! Wonderful experience. He loved it. Brilliant tutor. Thank you! Following the kayaking experience I reviewed last, Robb and I headed over to Bucklers Hard for an archery experience with New Forest Activities. Located on a farm, there were once again a myriad of animals wandering around, including chickens, pigs (and piglets! ), rabbits and cows. As Robb said, I think we’d seen more wildlife that day than in the entire year. We met our instructor for the session, Jake, who lead us through the farm to the archery range. The sun was starting to set over the fields, making a really beautiful scene for shooting some arrows. In the group were nine people, six adults and three young boys, so again it’s obvious this experience is suitable for everyone, just like the kayaking. After a quick briefing on how to hold the bows, load the arrows and shoot accurately, we took turns in groups of five and four to fire around six arrows each at the targets. After being absolutely useless at archery last time I tried it, I wasn’t expecting any miracles, but I actually wasn’t too bad! Maybe it was because we were alongside children, but still, I was definitely better than last time. 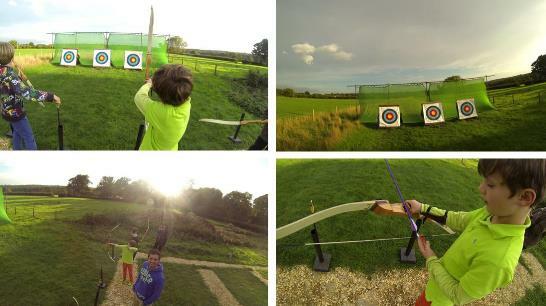 We had some fun with the Go Pros, placing them on top of the targets and trying to fire near them (not at them!). One man did actually knock the camera off, but luckily it survived. Jake got us playing some games like trying to hit one of every colour and getting all the arrows grouped together. Then the kids decided to teach us some games, which may not have made the most sense, but were still great fun. After a while the cows in the neighbouring field decided to wander over and watch, which distracted the younger participants for a while, before Jake got everyone back together for one last go. At the end we walked back through the farm, acquainting ourselves with the animals as we went, before it was time to head home. What a great day with New Forest Activities! The weather had been kind, and the people were great company. Big thanks to James and Jake for being fantastic teachers and making the day so enjoyable. This experience is perfect for a family day out or for those wanting to take up a new hobby, highly recommendable. What are the Archery Experience - Child age restrictions? The Archery Experience - Child age minimum age limit is 8. Anyone under the age of 18 will need to be accompanied by an adult. If I am accompanying my child who is under 18, do I also need to pay for the experience? Yes, you will have to pay to accompany your child for the experience.